I’ve been digging Jobs to Be Done Framework for the past months and one thing that always gets me is the idea of circumstances. Products we are using today are the result of circumstances that happen in our daily life. Circumstances may leads to interruptions which blocking our ability to progress. Some interruptions happen regularly, like they way we get hungry. Let’s say you are in the middle of work with tight deadline, you’ve skipped breakfast and only had a cup of coffee but eventually by the lunch time, you can’t handle it anymore. Hungry is the interruption. You need to finish the work but stomach couldn’t wait. it’s blocking your progress to finish the work. That is the case when Jobs to be done come in, you suddenly have a Job that needs to be Done in order to remove interruption. You need to find and eat some food. Not only that, you must get it as fast as possible because you don’t want to leave the work too long and don’t want to get very starving so you could not progress the work properly. Can your product solve the interruption? There is a good example from guys at Intercom on how they accommodate user’s circumstances by optimising the feature to be fit into what users are trying to get done with it. In what circumstances this feature will eventually be used by them? How can it remove the interruptions? How do we optimise the feature to fit the Jobs to be done? 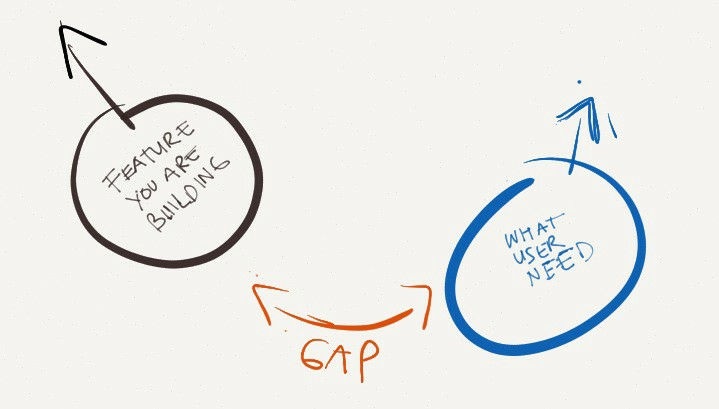 One way to minimise the gap and validate a product idea is to observe current user behaviour. You need to find out how they usually perform certain things that your product is trying to solve. You need to see how your product will fit into their current behaviour and try to break down the trade offs between current behaviour and new behaviour you suggested. If the good trade offs are leaning onto the current behaviour, there is a huge chances for resistances when they want to use your product. The food people want when they are hungry in the middle of traffic is different with someone hungry and alone in the house. People stuck in traffic want a simple food that they could buy while on the road, plus it should be easy enough to eat in driving mode whereas that guy at home might be thinking to get well rounded pizza considering the size, it would stays longer, so when he gets hungry anytime soon, he won’t be ordering another food. Just grab the pizza over again, if it’s still there. Although, those people have the same hungry interruption, the when, why, how and the time they get it is usually different. That leaves rooms for any products to fill into different kind of circumstances. Your product might have competitors that aim the same problem, but they way you build features to fit into certain user’s circumstances is what makes your product different.